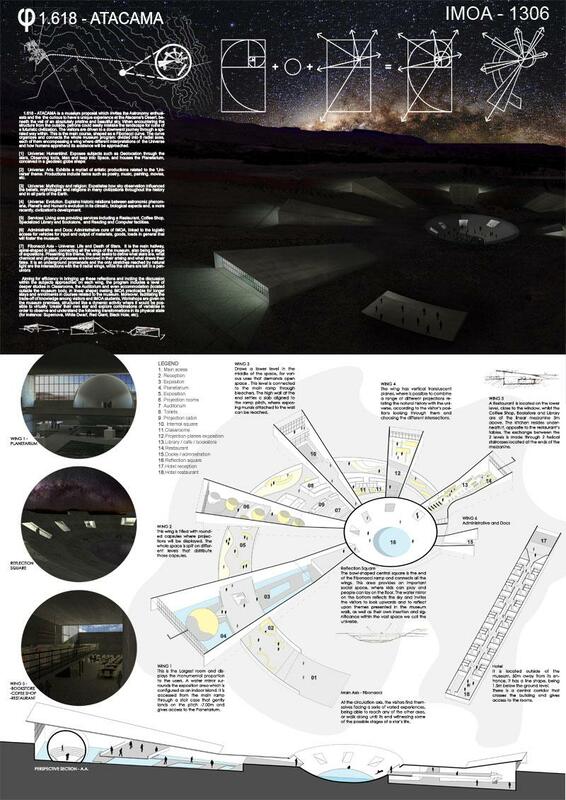 1,618 ATACAMA is a museum proposal which invites the Astronomy enthusiasts and the the curious to have a unique experience at the Atacama's Desert, beneath the veil of an absolutely pristine and beautiful sky. When encountering the structure from the outside, patrons could easily mistake the landscape for ruins of a futuristic civilization. The visitors are driven to a downward journey through a spiraled way within. This is the main course, shaped as a Fibonacci curve. The curve organizes and connects the whole museum program: divided into 6 radial axes, each of them encompassing a wing where different interpretations of the Universe and how humans apprehend its existence will be approached. Universe: Humankind. Exposes subjects such as Geolocation through the stars, Observing tools (like telescopes,satellites and stuff?? Maybe specify? ), Man and leap into Space, and houses the Planetarium, conceived in a geodesic globe shape. Universe: Arts. Exhibits a myriad of artistic productions related to the 'Universe' theme. Productions include items such as poetry, music, painting, movies, etc. Universe: Mythology and religion: Expatiates how sky observation influenced the beliefs, mythologies and religions in many civilizations throughout the history and in all parts of the Earth. Universe: Evolution. Explains historic relations between astronomic phenomena, Planet's and Human's evolution in its climatic, biological and, a more recently, civilization's development. Services: Living area providing services including a Restaurant, Coffee Shop, Specialized Library and Bookstore, and Reading and Computer facilities. Administrative and Docs: Administrative core of IMOA, linked to the logistic access for vehicles for input and output of materials, goods, loads in general that will foster the museum. Aiming for efficiency in bringing up these reflections and inciting the discussion within the subjects approached on each wing, the program includes a level of deeper studies in Classrooms, the Auditorium and even accommodation (located outside the museum body, in linear shape) making IMOA practicable for longer stays and enrollments in courses related to the museum. Moreover, facilitating the trade-off of knowledge among visitors and IMOA students, Workshops are given on the museum premises, structured like a dynamic activity where it would be possible to virtually 'çreate' their own star and explore combinations of variables in order to observe and understand the following transformations in its physical state (for instance: Supernova, White Dwarf, Red Giant, Black Hole, etc).